The combined MTHS choirs and orchestra crescendo to a climax as the concert comes to a conclusion. 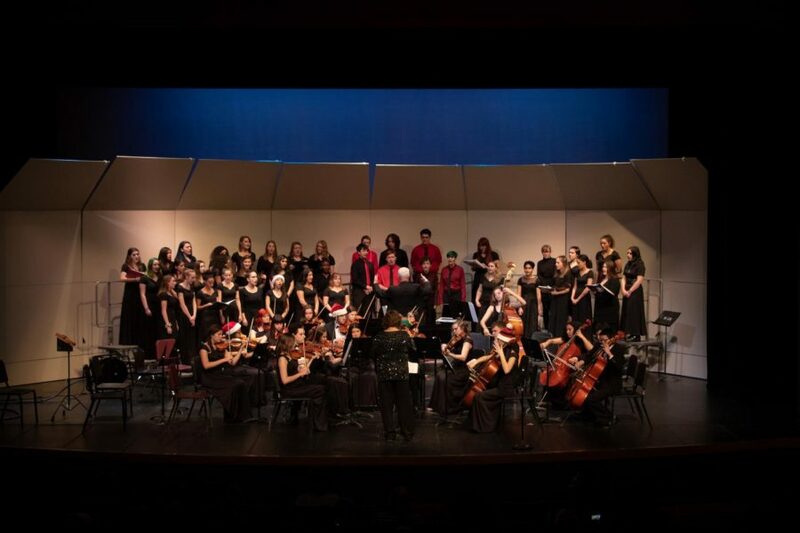 For this year’s winter concert on December 18, the MTHS choirs and orchestras both showed their individual strengths, but also came together in a show of interdisciplinary camaraderie in the music department in a festive and upbeat display. 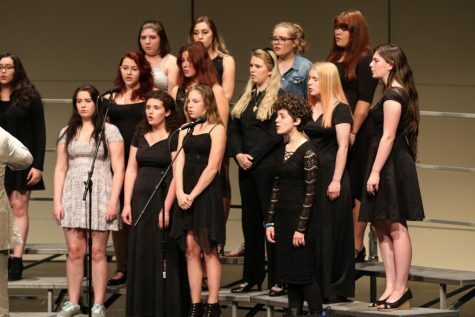 After an introduction by choir director Thomas Sullivan, the all-women Chamber Choir kicked off the night. “They’re just a joy to have every morning,” Sullivan said. His charisma was infectious, as evidenced by the humorous sound check that involved a game of numbering off, mostly in order. The Chamber Choir opened with “Mary Did You Know”, a Christmas song that strays from convention by taking a more introspective and reflective look at the origins of the holiday. Chamber Choir displayed their skill with rich harmonies and vocalized accompaniments. Their next piece was “Maria Matrem Virginem”, a hauntingly beautiful song which in Latin translates to “Mary, the Virgin Mother”, and featured poignant solos from freshman Kendall Johnson, senior Daisy Ramirez and freshman Alexa Szilassy. Sticking with a classical holiday theme, next came, “a very beautiful and interesting arrangement of Silent Night,” as Sullivan said. It was an arrangement by the a-cappella group Pentatonix, whose interesting sound translated well with MTHS’ Chamber Choir. “Since there aren’t any Avis or Scotts in the room, the keyboard will be playing that part,” he joked, referencing Pentatonix’s male bass and baritone vocalists. Finally, Chamber Choir wrapped up their set with an arrangement based on the metal band Disturbed’s cover of the classic Simon and Garfunkel song “The Sound of Silence”. The choir’s performance had all the heartfelt sentiment of the 1960s original, but with a fresh, modern twist. Next, the Dynamics choir opened with a delightfully amusing take on the drudgery of the classic carol “The 12 Days of Christmas”. Rife with purposeful mis-starts, blurring between carols and even a segment centered around the memorable 1980s hit, “Africa” by Toto, it was definitely an audience favourite as the choir demonstrated their comedic timing and acting chops. Soloist and junior Peja Shymko made quite the display, jumping out from formation and delivering a rousing, “Dreidel, dreidel, dreidel!” shoehorning a good bit of Hanukkah into a decidedly gentile number. “It’s really fun, because it has acting moments in it too. You’re supposed to be like, ‘Oh, I’m so confused and I don’t know what we’re singing,’ but guess what, we actually know exactly what we’re singing,” Shymko explained. Dynamics then transitioned into a vocal jazz arrangement of “In the Bleak of Midwinter”, a layered interpretation of the slightly melancholy classic. Finally, another Pentatonix arrangement, this time of “God Rest Ye Merry Gentlemen”, a lively and creative spin on a traditional carol which provided a high-energy ending to the choir department’s performance. After intermission, Concert Orchestra took the stage and began with a jaunty take on “Rudolph the Red-Nosed Reindeer”. “It’ll make you smile,” orchestra director Jennifer Schillen said. The orchestra followed up with two more merry songs, “Christmas Concerto” and “Holly and the Ivy”, the former a flowing piece characterized by series of legato chord tones but broken up with quick, staccato sections, and the latter featuring soloist Kaylee Gott on the congo drum and a repeating theme to tie the piece together with its continuity. Then, Chamber Orchestra tuned up and started with “Greensleeves”, a familiar tune with a powerful solo by senior violinist Lexi Fletcher. Next were two movements from Gustav Holst’s St. Paul’s Suite, “The Jig” and “Ostinato”. “The Jig” was a jolly piece, made very dramatic by the orchestra’s masterful control of dynamics. Smiles were visible upon many of the performer’s faces, making it very clear that they found this song a joy to play. “Ostinato”, which refers to a musical term for a continually repeated musical phrase, strongly featured exactly that. Holst, the composer, uses them heavily in many of his compositions and “Ostinato” is no exception. The pizzicato introduction rose in intensity to a stirring conclusion, raising the energy in the room. To conclude the show, two final pieces: “Carol of the Bells”, sung by the combined choirs, and brimming with intricate, moving parts. Lastly was a performance of the famous “Hallelujah Chorus” by all of the choirs and a small group of orchestra musicians. The tone was electrifying, and for a moment it seemed as if the theater turned into a cathedral. The choir displayed their range with a consistently climbing melody, and the orchestra matched their intensity with beautiful fluidity and canorous resplendence that made for a grand finale to the winter concert. “If we’re being honest, all three music groups—there’s this feud that goes on between us, and so when we get together and we collaborate with a piece, it’s beautiful, and I love it. 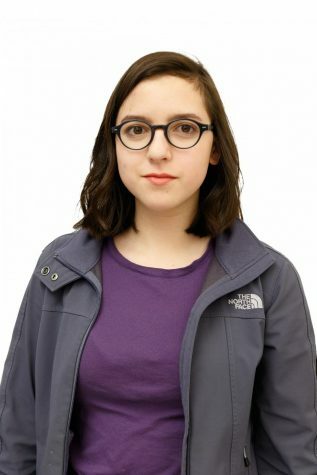 That’s why it’s been by favorite,” sophomore Chamber Orchestra bassist Haley Morris summarized.